A question to my fellow authors. 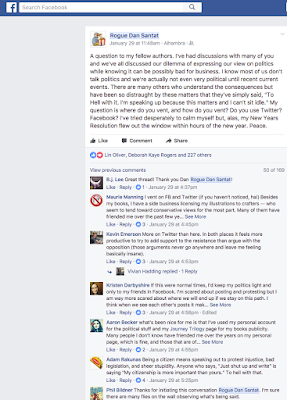 I've had discussions with many of you and we've all discussed our dilemma of expressing our view on politics while knowing it can be possibly bad for business. I know most of us don't talk politics and we're actually not even very political until recent current events. There are many others who understand the consequences but have been so distraught by these matters that they've simply said, "To Hell with it. I'm speaking up because this matters and I can't sit idle." My question is where do you vent, and how do you vent? Do you use Twitter? Facebook? I've tried desperately to calm myself but, alas, my New Years Resolution flew out the window within hours of the new year. Peace. Barney Saltzberg I don't think we can separate our politics from our work. Not at this point in the world, given what's going on in our country. To not say anything, as writers and communicators and artists is contrary to what we're doing on the planet. Eugene Yelchin Holly crap! Use whatever you can. Blow from every hole! The way this administration is moving ahead, there'll be no business for any of us! Grace Lin Rogue Dan Santat, thanks for this question. I don't know what the answer is but I want to tell you how much I admire you and all authors who boldly state their political opinions. I've found it really difficult; but I think the time has come that we have to take a stand. There are things that matter more than the selling books. I don't know if FB or twitter is where I will go, but I will always support you. Loni Edwards I am with you Dan. I can't just sit back and be idle while our whole country and the rights of many friends and family are on the line. If it losses potential customers, than those are not the ones that I want buying my stuff anyways. I promote the positive and love in my art, and I will do so as an individual citizen as well. It is our right to protest. It was how our country was founded. If some have their voices silenced, we need to be louder for them. Lee Sheppard I drew political cartoons under a pseudonym for that reason. It didn't affect my illustration work and I got the chance to vent. 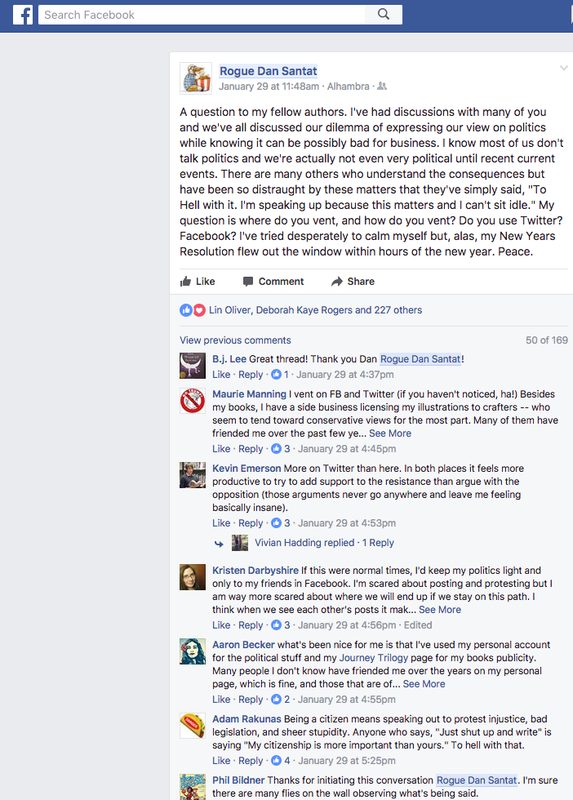 Georgia McBride Author and publisher who has lost many a social media friend, lost business from writers seeking to cancel contracts and even sue who support the new regime and who have been so bold as to admit it. Tony Abbott I think if you take the position that you’re going to write and illustrate books that only tell the truth to young people, then your work is part of what you “say.” That said, people who work creatively for children and young adults are an incredibly powerful voice against tyranny and illogic and oppression and intolerance. We don’t need or want an audience that would like us to be silent about what we believe. If we alienate by telling the truth, that’s part of being a human these days; I mean, after November 8, 2016. Speak, Dan! We need all voices! FB and Twitter. Everywhere. 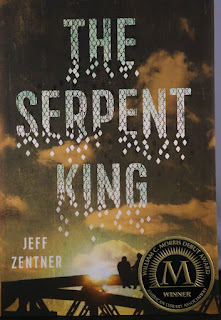 Kate Messner I've gone from being mostly not political on social media to speaking up almost daily. It feels morally wrong to me to be quiet in the face of what's happening. But that said, I wouldn't say that I "vent" on facebook or twitter. I try to share things there that are thoughtful and helpful and on the side of good. I vent at home and when I'm in closed groups, both in person and online, with other people I trust. Donalyn Miller I do not express my political beliefs when I'm working in schools, or presenting at educational conferences (particularly in conservative areas), although much of what is going on has little to do with politics and a lot to do with human decency. I don't see speaking up about civil and human rights as political, so I express these views everywhere. I also don't post anything on my BookWhisperer fan page. On my personal social media accounts, I feel I can say what I want as long as I am civil, do my best to fact check what I post, and maintain professional decorum. Same for my writing. I'm a citizen and I have these rights and the responsibility to speak up. Dianna Burt I've been typing into a document that is password protected just titled Rant. So I can get it out of my system and it's down somewhere. I figure if I need to I can print it out and set it on fire. Heidi Stemple Here's the way I see it--our readership is exactly who will be hurt by the insanity. 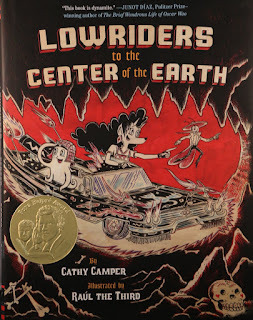 This administration is destroying their--our child readers'--natural world and creating a hostile global environment. I think it's our responsibility to speak out. Will it hurt me professionally? Perhaps. But I cannot live with myself if I don't speak truth to power. I'm trying to find ways to also be positive, but I will not be quiet--silence is what allows evil to multiply. Liz Garton Scanlon This is not democrat vs republican. This is democracy vs totalitarianism. Humanity vs inhumanity. Good vs. evil. Voice vs. silence. That last part is our role. Writing is, at its heart, a political act in that it is truth-telling, it is giving voice to what might otherwise be unspoken. I think this, now, is where the rubber meets the road. We speak. Have you considered where you draw the line? 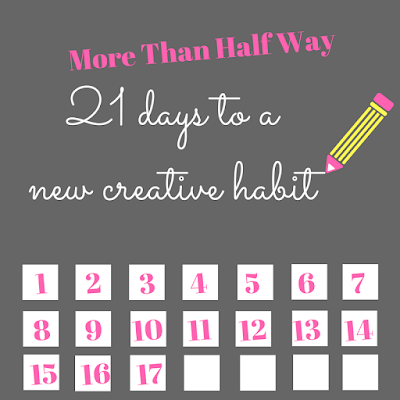 I blogged about the 21 days to establish a new creative habit back on January 10. 17 days ago. And I've managed to write for at least an hour every one of those 17 days. The first week or so was hard. I set my timer, and kept checking it. Every ten or fifteen minutes. And I'd stop right when I reached an hour. But it started to get easier. About day 8 I got really excited about what I'd written. (And didn't check my timer even once!) And even though things got crazy (a flooding house) on days 11 and 12 I made getting that hour in my priority, my escape. And the last three days, 15, 16, and 17, have been great. (Dry house + creative time = happy me.) I feel like I have momentum in my story, and every time I sit down, what I did yesterday is fresh in my mind. I jump in, and move forward, and it's really cool. It's feeling like a habit that's taking hold, and I'm thinking, maybe this is the gift I give myself for this year. The gift of time to be creative, every day. Just an hour, if that's all I have. But I can find an hour every day. I have 17 days of proof. And tomorrow will be 18. How about you? 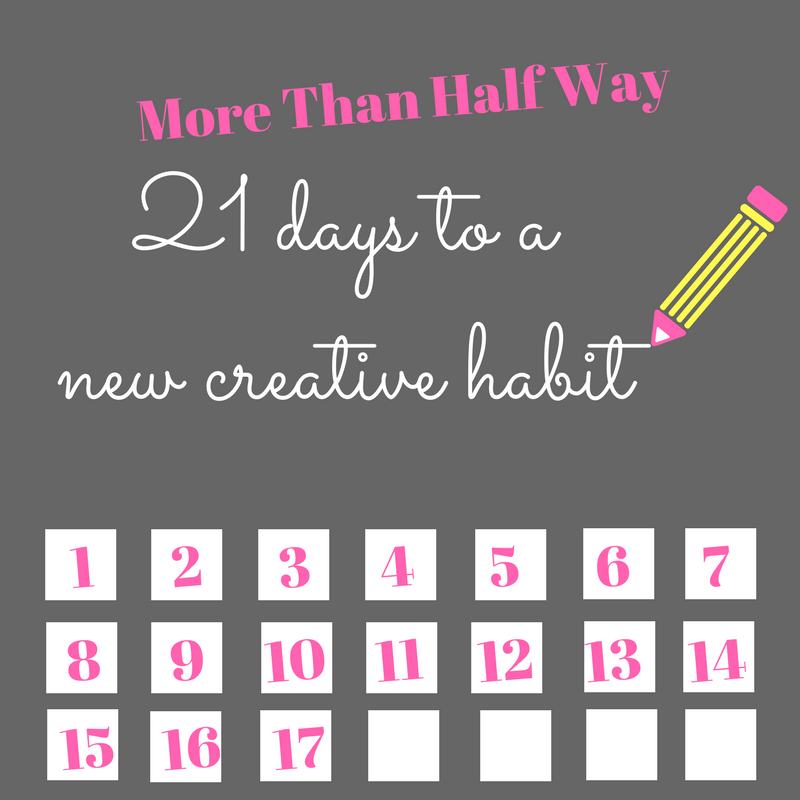 Are you on your way to a new creative habit? 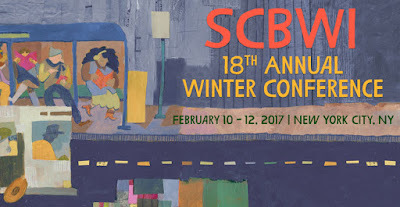 Do you need the jumpstart of a conference, like the upcoming SCBWI Winter Conference in New York city, or maybe you just need to tell yourself, "Today is the day I start." And give yourself the gift of time to be creative. 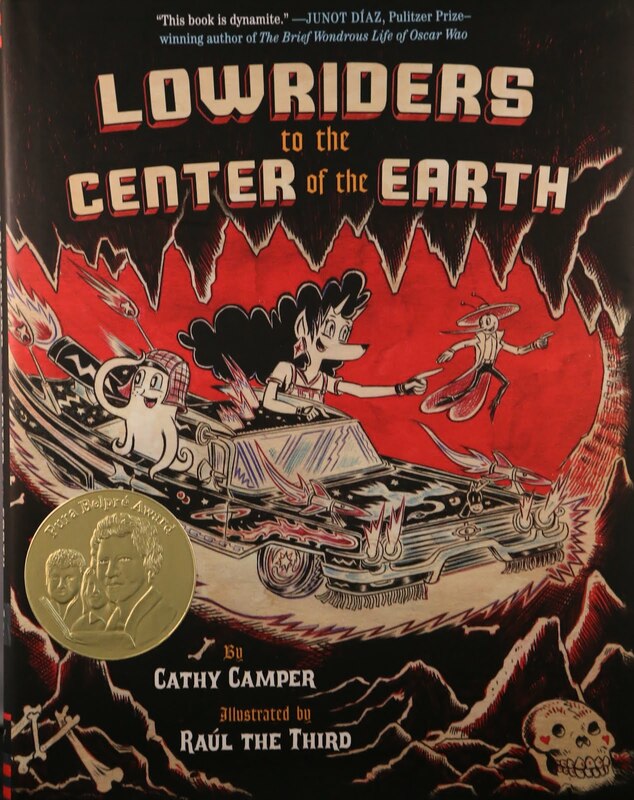 The 2017 ALA Youth Media Awards Are Announced! 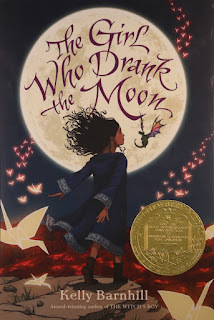 “The Girl Who Drank the Moon,” written by Kelly Barnhill. 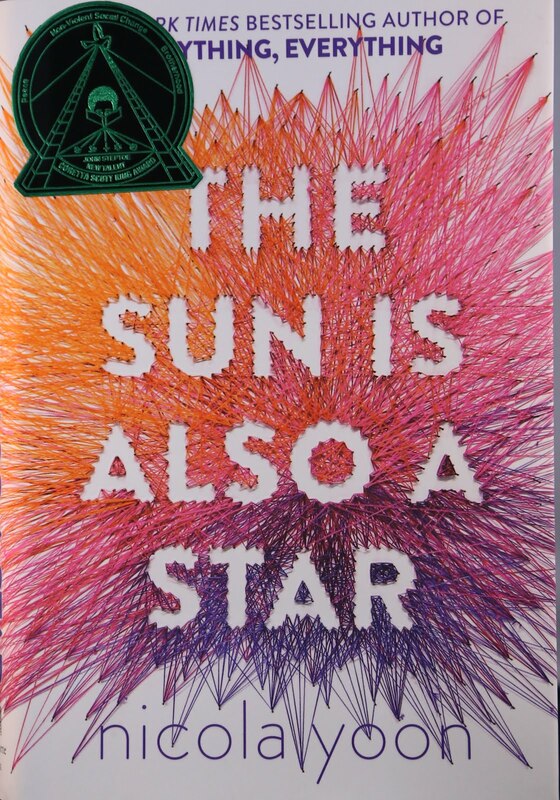 The Coretta Scott King/John Steptoe New Talent Author Award winner is “The Sun Is Also a Star” by Nicola Yoon. 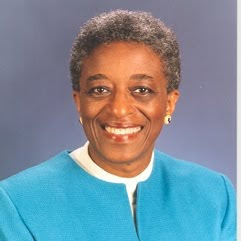 The Coretta Scott King – Virginia Hamilton Award for Lifetime Achievement goes to Dr. Rudine Sims Bishop. "Her influential writing, speaking, and teaching articulates the history and cultural significance of African-American children’s literature. 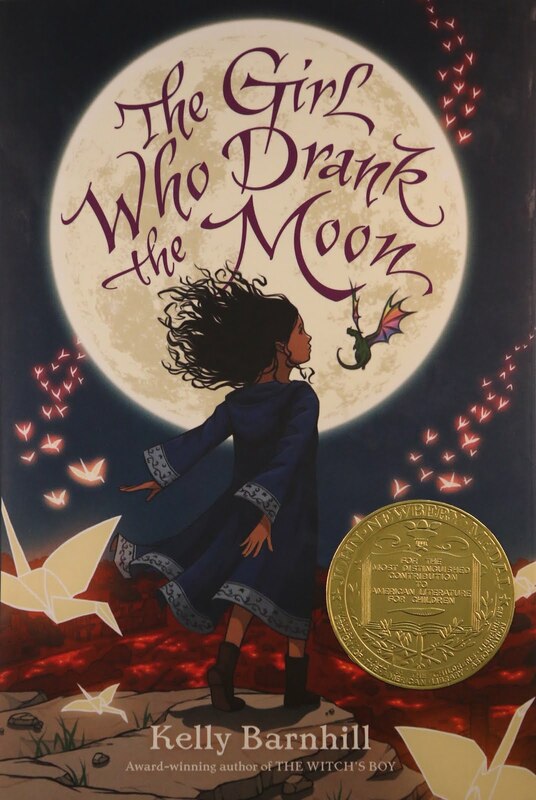 Her globally cited work, “Mirrors, Windows and Sliding Glass Doors,” has inspired movements for increased diversity in books for young people, and provides the basis for the best multicultural practice and inquiry for students, teachers, writers and publishing houses." 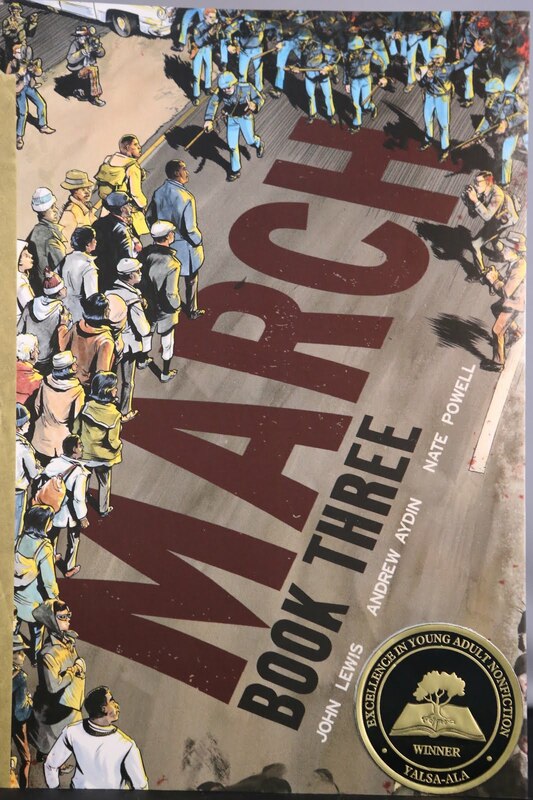 The Michael L. Printz Award for excellence in literature written for young adults winner is: “March: Book Three,” created by John Lewis, Andrew Aydin, and Nate Powell. 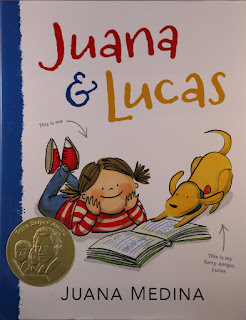 The Laura Ingalls Wilder Award is for an author or illustrator whose books, published in the United States, have made, over a period of years, a substantial and lasting contribution to literature for children. The 2017 winner is Nikki Grimes, whose award-winning works include “Bronx Masquerade,” which won the Coretta Scott King Author Award in 2003, and “Words with Wings,” the recipient of a Coretta Scott King Author Honor in 2014. 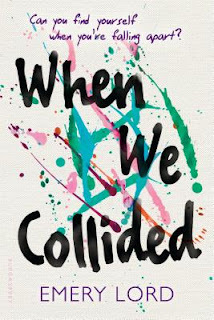 In addition, Grimes received the Virginia Hamilton Literary Award in 2016 and the NCTE (National Council of Teachers of English) Award for Excellence in Poetry for Children in 2006. 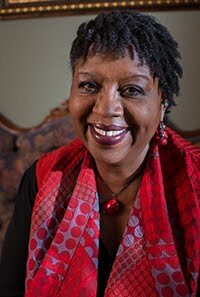 Nikki Grimes won the 2017 Laura Ingalls Wilder Award. 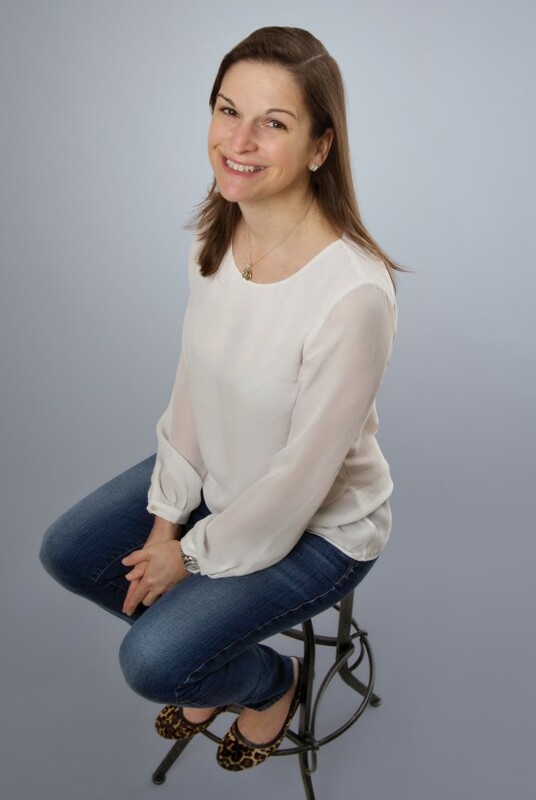 The Margaret A. Edwards Award for lifetime achievement in writing for young adults: The 2017 winner is Sarah Dessen. Her books include: “Dreamland,” “Keeping the Moon,” “Just Listen,” “The Truth about Forever,” “Along for the Ride,” “What Happened to Goodbye?” and “This Lullaby." 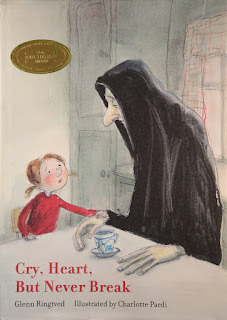 The Mildred L. Batchelder Award for an outstanding children’s book originally published in a language other than English in a country other than the United States, and subsequently translated into English for publication in the United States winner is: “Cry, Heart, But Never Break.” Originally published in Danish in 2001 as “Græd blot hjerte,” the book was written by Glenn Ringtved, illustrated by Charolotte Pardi, and translated by Robert Moulthrop. 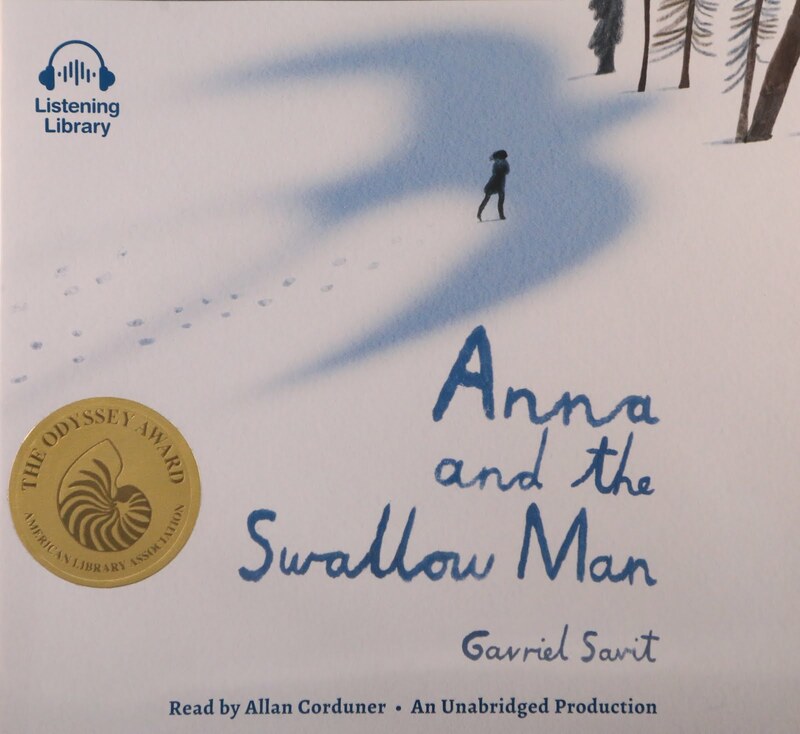 The Odyssey Award for best audiobook produced for children and/or young adults, available in English in the United States winner is: “Anna and the Swallow Man,” written by Gavriel Savit and narrated by Allan Corduner. 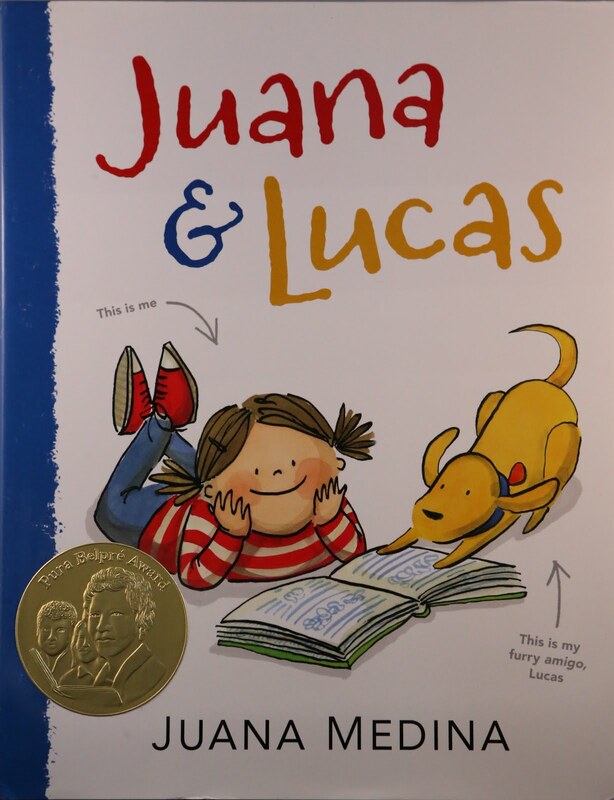 The Pura Belpré Awards honoring a Latino writer and illustrator whose children's books best portray, affirm and celebrate the Latino cultural experience winners are. 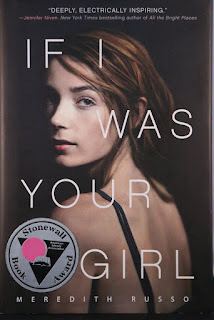 and “If I Was Your Girl” written by Meredith Russo. 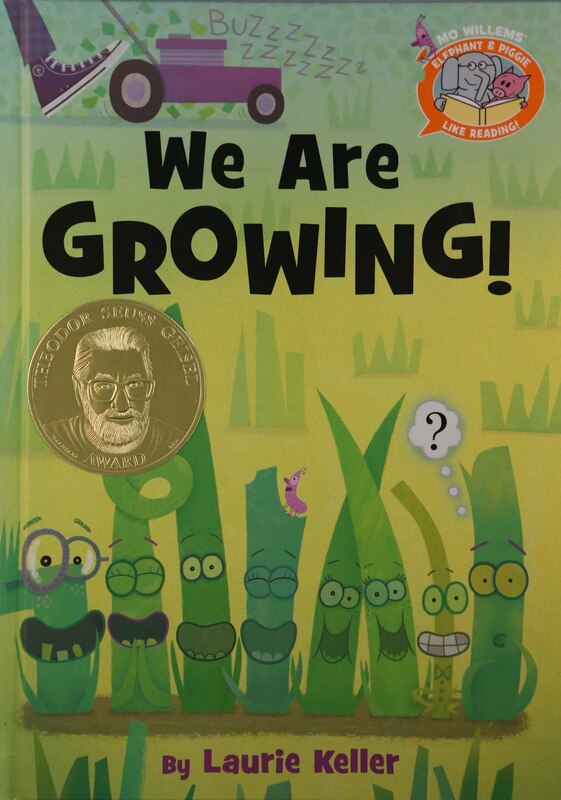 The Theodor Seuss Geisel Award for the most distinguished beginning reader book winner is: “We Are Growing: A Mo Willems’ Elephant & Piggie Like Reading! 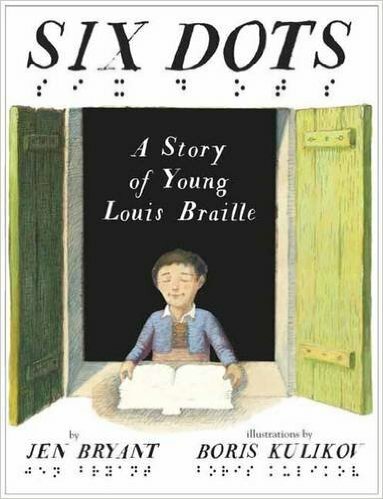 Book,” written by Laurie Keller. The William C. Morris Award for a debut book published by a first-time author writing for teens winner is: “The Serpent King,” written by Jeff Zentner. 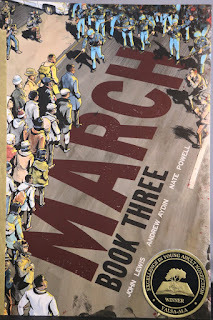 The YALSA Award for Excellence in Nonfiction for Young Adults winner is: “March: Book Three,” created by John Lewis, Andrew Aydin and Nate Powell. You can see the full list of all the winners and honorees here. 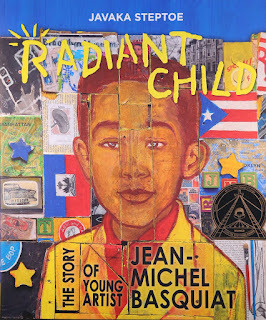 The SCBWI Spark Award recognizes excellence in a children’s book published through a non-traditional publishing route. The 2017 illustrated book winner is Soldier by Kara Van Kirk Levin. 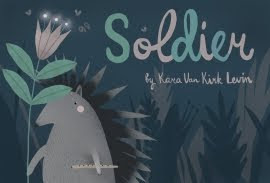 Soldier tells the story of a lonely young porcupine who feels isolated from his community, and the friends that band together to help him feel valued. The rich illustrations were created by Vlada Soshkina and Polina Doroshenko. Drawing on themes of compassion and inclusivity, Soldier is Levin’s debut book. Find out more about Kara’s independent publishing company Little Wooden Flute at www.littlewoodenflute.com. 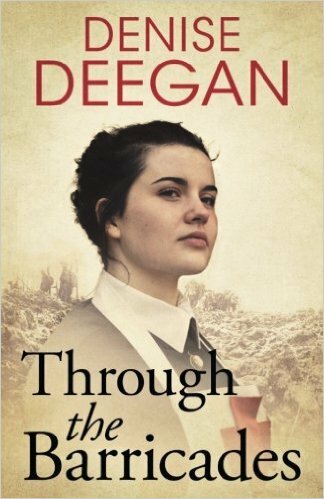 The 2017 book for older readers winner is Through the Barricades by Denise Deegan. Deegan’s romantic young adult novel brings to life turn-of-the-century Dublin, as two teenagers, Maggie and Daniel, confront issues of class and privilege during the 1913 workers strike. 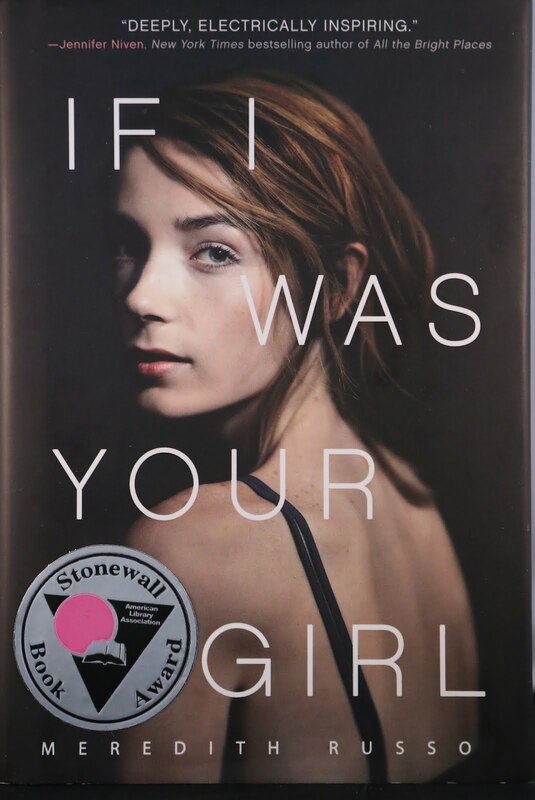 Deegan has also published contemporary YA with Hachette and adult family drama novels under the pen name Aimee Alexander. You can find more of her writing at www.denisedeegan.wordpress.com. Congratulations to both Kara and Denise! 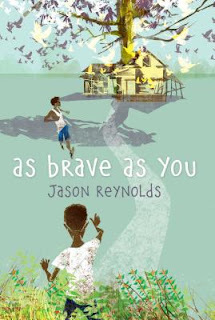 Both winners will be invited to take part in a book signing at an SCBWI conference this year. They will also receive free conference attendance, a Spark seal for their books, a press release and publicity through the SCBWI media networks. You can find out more about the Spark Award here. Nearly all the extra-day intensives are sold out (there are only a few spaces remaining in the Writing The Verse Novel intensive), and the main conference itself is on-track to sell out as well. 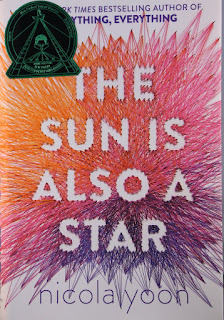 Don't miss your chance to hear keynotes from Bryan Collier, Tahereh Mafi, and Sara Pennypacker. Your chance to be in the room for Panels on the Four Types of Picture Books, Children's Books in the Social Media World, and The Current Landscape For Children's Books. 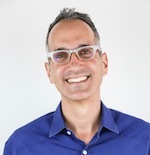 Your chance to attend three workshop sessions (your choice) where experts (celebrated authors, illustrators, agents, editors, and art directors) take you deeper into topics like Picture Book Pacing, Creating Books for Diverse Audiences, Making Your Work Memorable, First Chapters, Writing Nonfiction for Children and Young People, Unlocking the Power of Your Unconscious Mind, Self-publishing Done the Right Way, How to Handle Difficult Subjects, Social Media: An Author's Best "Frenemy", and many more! Your chance to display your portfolio in the Art Browse, to attend the Gala Dinner, the Socials (including the LGBTQ + Allies, Illustrators, New Members and First Time Attendees, and the International/Spanish/Translator Socials), and the Autograph Party! 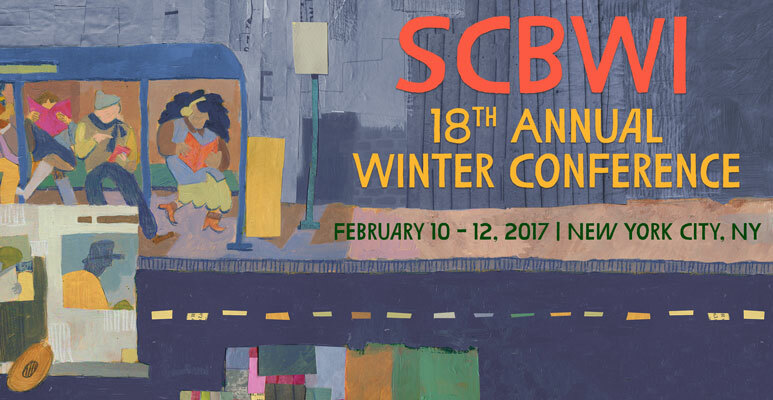 It's your chance to dive into all the inspiration, craft, business, opportunity, and community that SCBWI offers - all in one amazing weekend in New York City, February 10-12, 2017. You can find out all the conference details and registration information here. What's Your New Creative Habit? Those are boxes to check off - feel free to print out the image to keep on track! Research shows that it takes only twenty-one days-in-a-row of doing something to make it a "habit." January seems like a perfect time to bring this to life: What's a creative habit YOU want to have? Is it to draw for an hour a day? Or maybe draw one scene a day? Or is it to write for an hour a day? Or maybe write one new scene a day? Or is it a character study a day? Or a character diary entry a day? 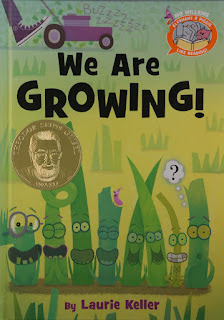 Or to brainstorm a new picture book idea a day? Or to write a new poem a day? My friend April Halprin Waylan writes a new poem a day, every day. It's inspiring. And even though I've tried to get into this habit before, I'm going to try to write for one hour a day. Every day. Starting today. It's January 10, 2017. 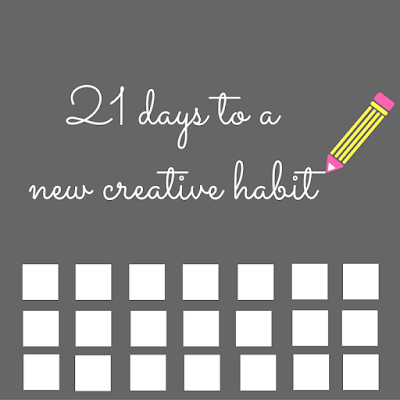 I should have that new creative habit by January 31, 2017. 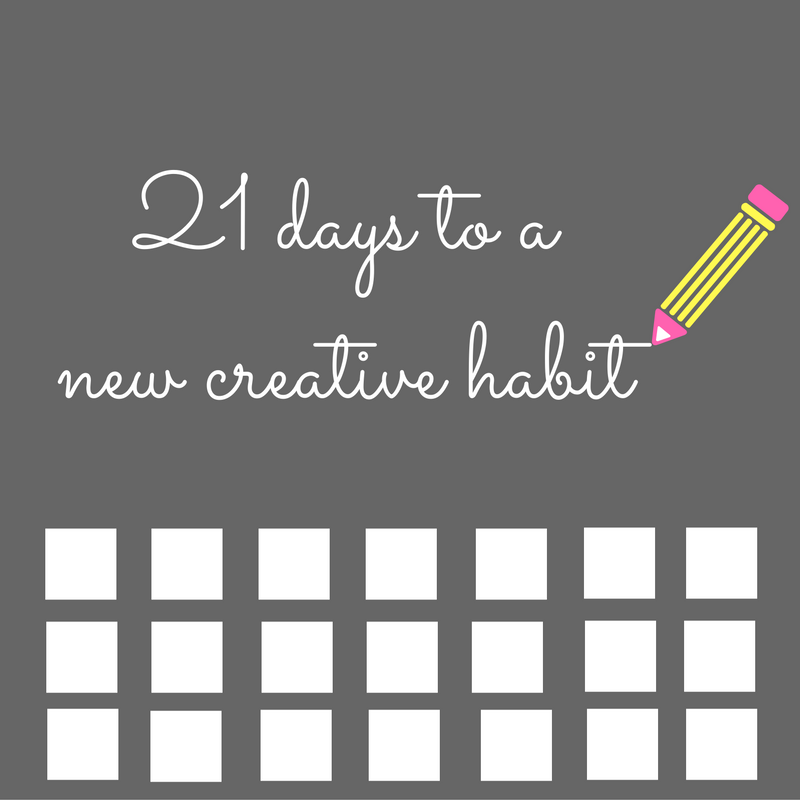 What's your new creative habit going to be? 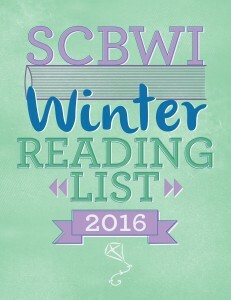 Check Out The SCBWI 2016 Winter Reading List! 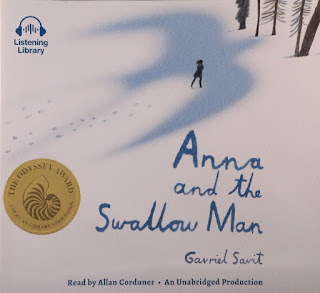 The SCBWI 2016 Winter Reading List includes books of all genres from our PAL authors and illustrators (one book per member), both frontlist and backlist titles. Organized geographically, you can find books created by SCBWI members in your home state and around the world! The free list is available as a downloadable pdf here. "Stop wondering what they want. Stop looking at other people's work. Make the art that is YOU. The art that you were born to make. 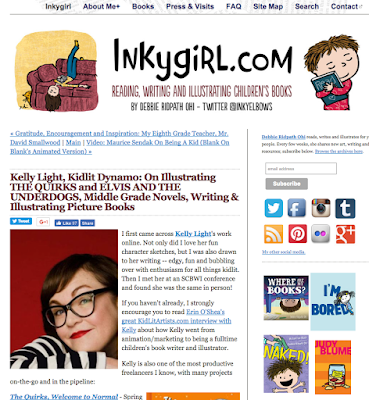 Debbie: What advice do you have for those interested in illustrating middle grade novels? 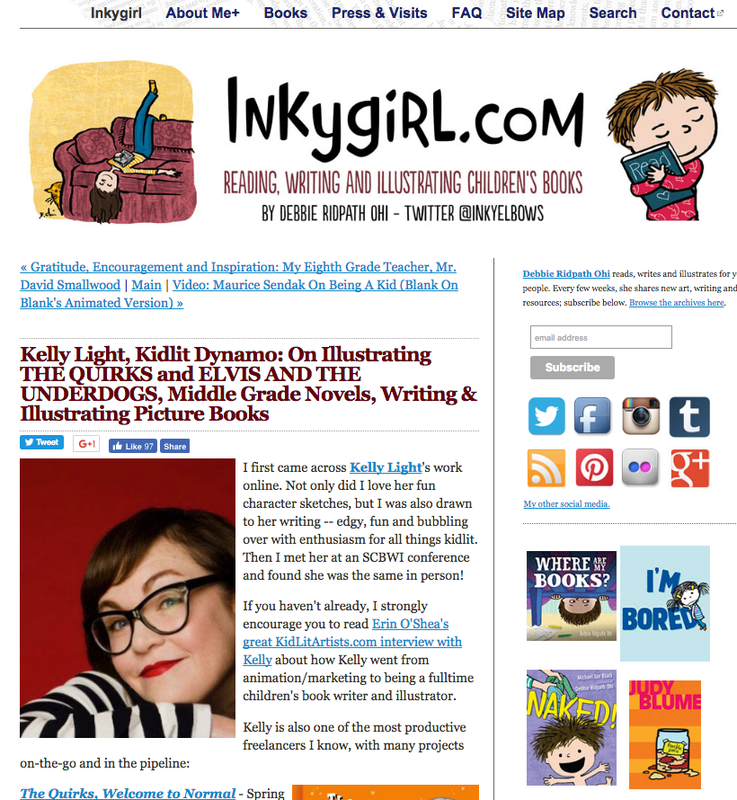 Kelly: I think what I can say to those who wish to illustrate MG chapter books is - It's all about character. You are drawing for 7-11 year olds. These kids want to know the characters. This is the age when the characters are your friends. 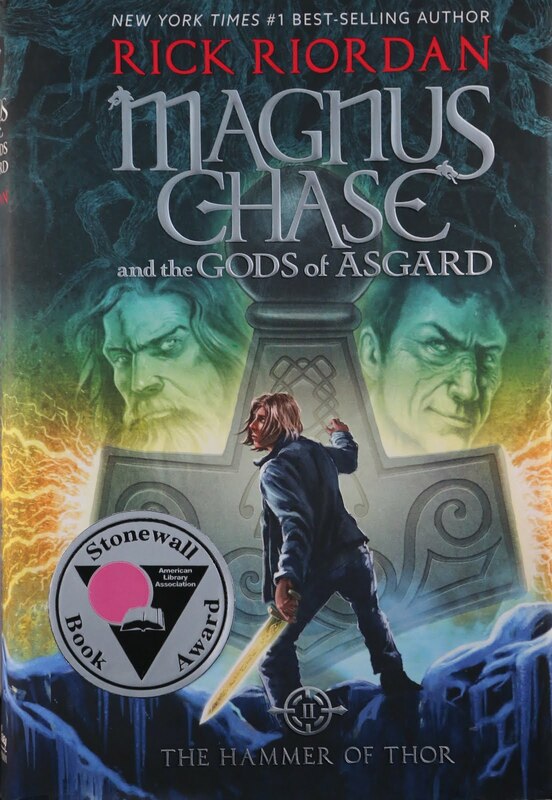 The characters help you get through some crazy changes in your life. They want to connect- SO be specific with the "WHO". WHO is the main character?... draw them so they feel real...like they could sit next to them at school. Who are the friends and the side kicks and the adults? They should all have something recognizable to the reader, just like in real life, no matter how unrealistic you may draw them. They should FEEL real. Also... bring THE FUNNY. This age loves to laugh. The illustrations in MG can really add humor and another layer to the text. I am a true believer in Laughter is the best medicine- and this age group wants to laugh their way into and through their tweens... Having some strong black and whites of the right age kids in your portfolio in REAL moments that happen in 4th grade- 5th grade. Braces. Awkwardness. Cliques start to form. Girls travel in packs. Bullying or standing up to it. School stress. Being bad at sports. Someone is an underdog. Science Fair explosions... There- I gave you some ideas!! You can read the whole interview here. Thanks, Kelly and Debbie!